The wildfires in California have resulted in a shortage in the supply of wine. In order to ensure their supply doesn’t run dry, many wine lovers have resorted to stocking up on their favorite selections. This means that it is now more important than ever to ensure you are storing your wine properly. If you are looking to store your wine temporarily or long-term in order to age it, follow these wine storage tips! Why is it Necessary to Properly Store Wine? Imagine spending time picking out the perfect bottle of wine, aging it in order to improve the flavor, and then discovering that at some point during the storage process, the wine had gone bad. The best way to prevent your wine from going bad is to ensure you are taking the necessary precautionary steps when storing it. Try out these wine storage tips! Any exposure of light to your wine will degrade the quality of your wine and can cause it to age prematurely. Store your wine in a dark room away from any sunlight, ultraviolet rays or windows. While it is equally as important to protect both your red and white wines from light, white wines are more susceptible to damage caused by light. Over time, red wines will also see a degradation in quality when they are exposed to light but it will take longer than white wines. When wine is exposed to air, it will oxidize. It is extremely important to keep the wine cork damp in order to prevent it from drying out and cracking, which can let air in. A wine rack or wine holder will angle a wine bottle on its side and keep the cork damp enough to prevent cracking. If the wine bottle does not have a cork and instead has a screw cap, plastic cork or glass top, it will not be necessary to store your wine bottle on its side. In order to prevent damage from occurring to your wine, it is important not to store it in a location that is too hot or too cold. Wine that is stored in a location that is too hot will age prematurely. The cork on a wine bottle that is stored in an area that is too cold will dry out which can result in the wine becoming exposed to air. 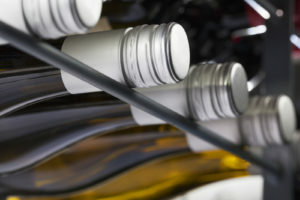 To keep your wine from becoming damaged, ensure it is stored within a safe range of temperature. Are You In Need of a Location to Store Your Wine? If you’re in need of a location to store your wine, consider a storage unit that will control the environment. Storage World has locations in Stockbridge, Jonesboro and Decatur that are capable of controlling the environment in your storage unit. Additionally, all of our storage units are dark, creating the optimal condition for wine storage. Are you interested in learning more about a storage unit rental at one of our storage facilities? Contact us today!